RM Sotheby’s is the world’s largest auction house for investment-quality automobiles. For more than 35 years, we have cemented our position as the market leader and successfully transformed the global automotive auction scene, helping to elevate the perception of collector car auctions to premium events executed at the same level as high-end art auctions. Our vertically integrated range of services, from restoration to private sales, auctions and estate planning, coupled with an expert team of car specialists, international footprint, focus on quality of product and inventiveness of presentation, provides an unsurpassed level of service to the global collector car market. Our business has been fuelled by a love of cars and a passion for producing results since 1979. With an emphasis on the top-tier of the market, we’ve had the privilege of selling hundreds of million-dollar-plus automobiles at our catalogue auctions, attracting buyers and sellers from all corners of the globe. As evidence of our global footprint, in 2017, bidders represented more than 60 countries, from Russia and the Middle East to Asia, Europe, and the Americas. Each year, RM Sotheby’s presents a diverse calendar of annual auctions hosted in some of the most prestigious settings across North America and Europe. Influenced by location, each event possesses a distinct character, ensuring that any automobile or collection will find the perfect auction venue on our roster. Currently, RM Sotheby’s proudly holds six of the top ten all-time records for the most valuable motor cars sold at auction. In February 2015, RM Auctions formed a strategic partnership with Sotheby’s, the world’s oldest auction house, to become RM Sotheby’s. The partnership has united the two companies for the full calendar of future automobile auctions and has already proven highly effective in creating a global platform for collector cars and introducing new audiences to our thrilling hobby. RM Sotheby’s also has a reputation for partnering with the world’s leading and most exclusive events, and is proud to be the official auction house of the Concorso d’Eleganza Villa d’Este. Held on the grounds of Villa Erba, every two years, Villa Erba is RM’s premier European ‘boutique’ sale, focusing on an elite number of very special, highly sought-after cars. To illustrate the exclusivity of the event, the last sale in 2017 realized €25.4 million, with eight cars grossing over €1 million each. The top three lots sold at the last Villa Erba auction included a 1937 Talbot-Lago T150-C SS ‘Goutte d’Eau’ Coupé, selling for €3.36 million, a 1935 Bugatti Type 57 Atalante Prototype that made €3 million and a 1993 Porsche 911 Carrera RSR 3.8, fetching €2 million. We are delighted to return to Villa Erba in 2019 for what promises to be another outstanding sale featuring some of the world’s finest historic automobiles. 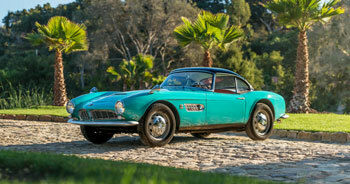 RM Sotheby’s is the official auction partner of BMW Group Classic at the Concorso d’Eleganza Villa d’Este.